Once cured, cast iron cookware care is easy, but seasoning it is something many want to avoid, even going as far as to discard them. There's no need to waste this good performing cookware because it's not that difficult to cure a pan and a few care tips can also extend its seasoning cycle too. A new uncoated or non-seasoned cast iron fry pan also must be cured or seasoned before you can use them―there's no way around that. That includes old pans you inherited from your grandmother, picked up at yard sales (unless in great shape) and any other older cast iron cookware. This priming process is usually referred to as 'curing' or 'seasoning,' but both mean the same thing. 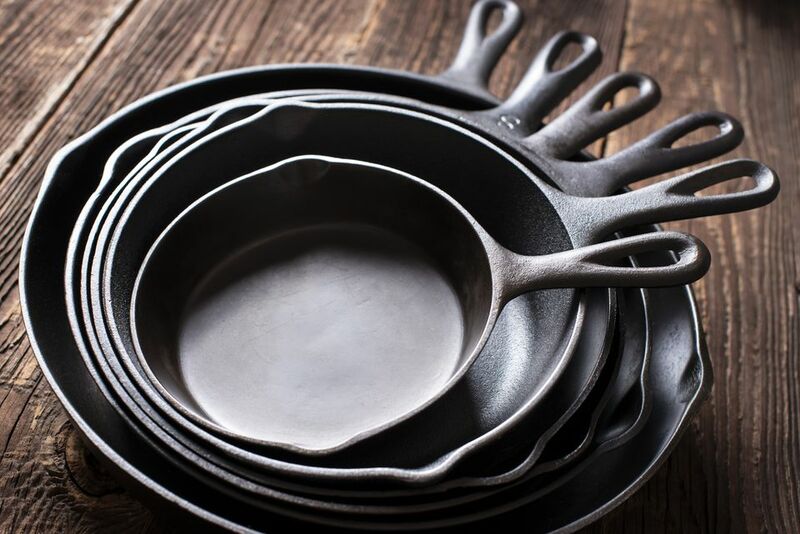 Cast iron cookware should be cured inside and out including lids, if the pan is new and has not been pre-cured by the manufacturer, or if your pan is old and the finish has worn off. You'll easily recognize a pan with a worn coating. It might be rusty, have a whitish or gray interior, or be so rough looking that you wouldn't be able to cook an egg in it, even if you wanted to. As for newly purchased cast iron, many manufacturers are now marketing pre-seasoned pans. In this case, the curing process has been done for you, but be sure to read the product information carefully to confirm that it is indeed cured. You also need to know if there are any initial cleaning or washing instructions to follow, as well as on-going care. That's very important because, without proper care, your pan could get back to square one regarding needing to be cured anew. The words 'curing' and 'seasoning' both refer to the process of coating your pan with (vegetable) grease/oil and oven-cooking it to set the finish. This fills the cast iron pores and gives the pan a natural, nonstick-type coating. To maintain the curing on your pan, you should only rinse or quickly wash with mild soapy water after each use. Some cooks simply wipe the pan with a wet cloth. Too much scrubbing or immersing for several minutes in hot water will remove or wear down the curing, and the pan will require a re-seasoning. It is normal for your pan to need curing periodically, as the finish does wear off over time with use. Prepare your pan by scrubbing it with hot soapy water, ensuring there is no food residue, grime or rust, and dry it completely. Warm the pan up slightly and apply a coat of melted grease/oil to the inside and exterior of the pan, including the lid and handle. Liquid cooking oils are not recommended, but some do prefer to use peanut oil (allergy alert). There are also specially formulated oils on the market for the curing process. If buying a new unseasoned pan, check to see if they recommend a certain seasoning process for their pans. Preheat your oven to 350 F and put your cookware in upside right, on a foil or parchment paper covered cooking sheet, to catch any drips. If you use a non-covered baking sheet, it will require a good scrub afterward. The foil or (oven) paper is simply to save on cleanup. Bake for approximately 20 minutes. If it starts to smoke, you must reduce the temperature by 10 to 15 degrees until it stops. This may increase the time by a few minutes, but will not hurt the cure. Drain off any excess grease and put the pan back in the oven, this time upside down, for 1 to 3 hours. A re-seasoning may only require half of that time; it depends on the condition of the pan. Turn the oven off and let the pan cool down naturally before removing it. You now have a seasoned cast iron nonstick cooking implement that will last a lifetime with proper care. Why bother going through this process to season an old cast iron skillet? Cast iron is the best performing cookware for many foods, because of the even heat distribution. Even Granny's bean pot was cast iron. This was the cookware of choice decades ago, and today, you'll find one (or more) of these pans in every chef's kitchen. You do need to be proactive with care, though, if you want to keep this cookware in top shape. For those who love the cooking performance but don't relish the care required, there's also a good variety of enamel-covered cast iron cookware on the market, including casserole dishes. These are a joy to use and cook with it yet easy to clean. There is a slight learning curve to keeping those eggs from sticking in cast iron, as with any other type of cookware. Unlike with regular nonstick coatings, you can use nearly any cooking utensil in one of these pans—silicone, metal, wood or plastic. But, do avoid cutting with a sharp knife in these pans, which can mar the finish. Cast iron is also the recommended type of cookware for use on an outdoor campfire. Note that these pans are extremely heavy and that may matter to some. Handles can get extremely hot; protect your hands.